Theatre Titas’ debut production 'WHAT’S IN THE DARK?' creeps up on us this Halloween! 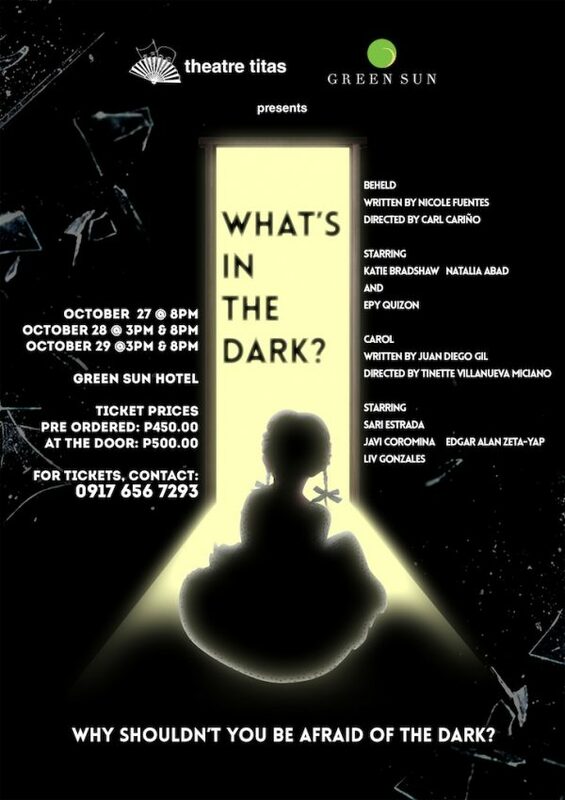 Theatre Titas’ debut production ‘WHAT’S IN THE DARK?’ creeps up on us this Halloween! 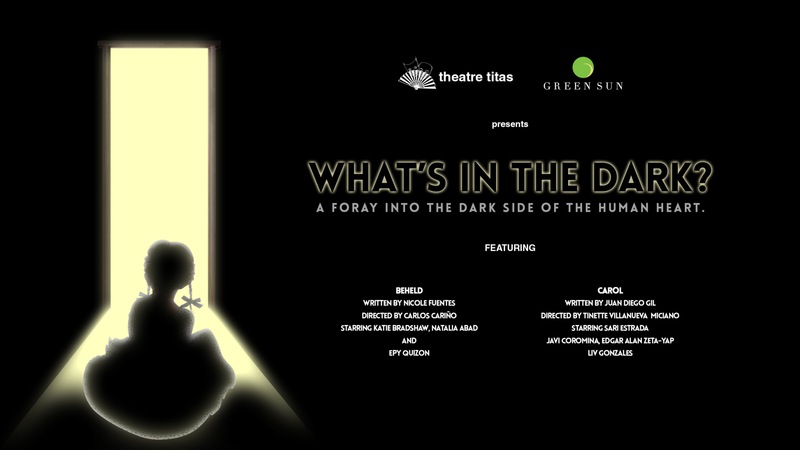 Up and coming theatre group, THEATRE TITAS launches its maiden production, WHAT’S IN THE DARK? this Halloween weekend in cooperation with Green Sun Hotel. What’s In The Dark? is a foray into the dark side of the human heart, comprised of two original scripts, BEHELD and CAROL. BEHELD, written by published author Nicole Fuentes and directed by educational theatre practitioner and Maria Montessori Children’s school Executive Director, Carl Cariño, is an intimate piece in all aspects of the word. It explores the wounded psyche of a man through the innocent and truthful eyes of a child, who looks evil in the face and stares it down. 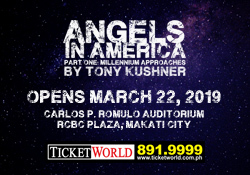 BEHELD stars Katie Bradshaw (Fun Home, Shrek the Musical) and Natalia Abad (MMCSFI’s Romeo & Juliet) alternating as the naïve protagonist Claire, and stage and screen veteran Epy Quizon (Heneral Luna, Markova, FPJ’s Ang Probinsyano) as the dark and dangerous Saul. CAROL, written by Juan Diego Gil and directed by Tinette Villanueva Miciano, deals with love, incredible loss, the lines we should not cross, and the consequences that we must face when we transgress morality. CAROL stars Edgar Alan Zeta-Yap (UA&P’s adaptation of Ionesco’s The Lesson and Reza’s Art) and Javi Coromina (UA&P’s take on Goldoni’s A Servant of Two Masters and The Importance of Being Earnest) alternating as the distraught father Newton, Sari Estrada (The Country Wife, Egg Theater Company’s Moliere PMS) as the mournful mother Jill, and Liv Gonzales (A Little Princess, WCOPA 2015 champion) as the titular Carol. Theatre Titas is a group of individuals whose common denominators are a passion for live theater and a commitment to stage a diverse selection of works, not for the sole purpose of monetary gain but for the love of theatre itself. Members aim to stage old, new, proven, and experimental works. They play, devise, and explore various themes, concepts, and styles. They not only stage, but critique, discuss, interpolate, and share theatre experiences; usually over a glass of wine, several plates of sushi, and two slices of cake each. WHAT’S IN THE DARK runs at The Axon at Green Sun Hotel from October 27 – 29, with 8pm shows on all dates and 3pm matinee performances on the 28th and 29th of October. Tickets are PhP 450.00 each when pre ordered, and PhP 500.00 at the door. For group discounts, message Theatre Titas PH on Facebook. This run of WHAT’S IN THE DARK is sponsored by Cherifer and Sun Life Financial.